Deb's Cup of Tea: DIE! I really don't like killing insects, except for June bugs and mosquitoes. I usually try to get a spider onto a piece of paper so it can be tossed outside. Insects are part of our ecosystem and there is usually a purpose to them. 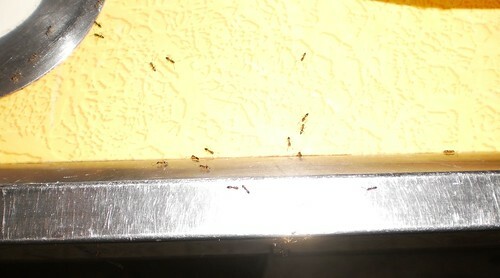 These ants in my kitchen, I have decided, are NOT part of the purpose. I have scrubbed. I have washed. I have disinfected. I have sprayed the perimeter of the foundation. Every single day, for the last 10 days, I have had ants in the kitchen. Sometimes, it's not a lot. Sometimes, as it was when I walked in this morning, it's hundreds. I made teriyaki chicken with pasta for supper last night. The ONLY things dirty were a plate, some silverware, the pot that had the pasta water and the baking dish that had the marinade. They were all over the plate and silver and inside the pot because I had mixed parmesan cheese in with the hot pasta. It's been beyond depressing to clean and clean and clean and they find yet another way of getting in. They were still massing when I came home from work tonight. This is where they were coming in. This spot, where the bright flash reflected, is a junction where the upper right corner of the door under the sink meets the cabinet. I opened up the area under the sink and they are crawling across the wall under the sink. Hundreds of them. So, thanks to friends on Facebook, and my sister's suggestion, I stopped at the hardware store and got Terro. I put out one spot at that point where they are coming onto the top of the counter. I know that's in the food area, but that's where they are and the box says to place the killer where they are. Once they are gone, I can clean thoroughly again. It took them a minute to discover the Terro. Since then, I have refilled the spot 4 times. I decided, since I have so many, the box said to put out multiple drops. Right now, I have 3. Within 2 seconds of getting Terro on the little piece of cardboard they give you, the ants have swarmed it. 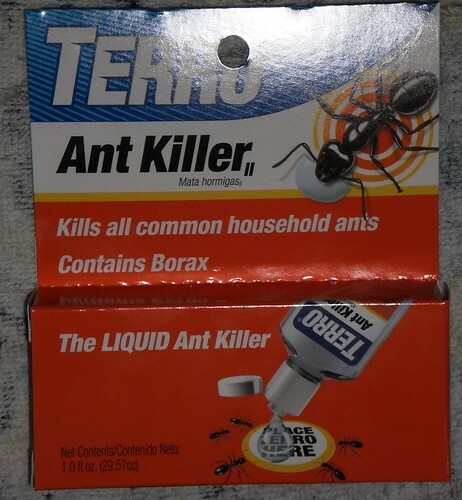 The box says it could take up to 2 weeks to fully kill a large colony. I think, since I haven't seen any hills outside, they are either under the deck or in the foundation wall by the back door. As this has been an ongoing problem, I am prepared to continually refill these little pieces to make sure the ants eat this stuff. They are not on the stove, but I don't want to cook anything because I'm just inviting them to find other food sources. I really don't like the idea of eating out but I might have to tomorrow. We'll see what it looks like in the morning. My girls have never been up on the counter and show no interest in doing so. I am confident they won't get into this. It would be different if I had to put it on the floor. I would worry. I hope the morning brings less crawlies. That would be a good way to start a day.